In some years, January temperatures in Missouri are “pretty-all-the-same.” Other years, they are all over the place (see previous post). Why? One reason is because of a wobbly Polar Vortex. A wobbly Polar Vortex. Let me explain. We’re familiar with low air pressure systems from the nightly weather report. Often, they bring storms. Around low pressure systems, the wind flows in a counterclockwise circle, called a cyclone. A tornado is a small, very intense cyclone around a low pressure area, while a hurricane is a large cyclone around a low pressure area. Both tornadoes and hurricanes are intense, but relatively short-lived. Thousands of feet above the Arctic sits a more-or-less permanent low pressure area attended by a cyclone. But instead of encompassing an area of a mile or less, as does a tornado, or of a hundred miles or so, as does a hurricane, the cyclone above the Arctic encompasses several million square miles. The air rushes counterclockwise, circling the North Pole at up to 100 miles per hour. Because the system is a low pressure system, and because the air rushes around it in a coherent circle, this cyclone has the effect of containing the frigid air of the Arctic. This system of low pressure, cold air, and counterclockwise wind is called The Polar Vortex. For this blog post, what we need to know about it is that it contains the frigid arctic air, preventing it from spreading southward. 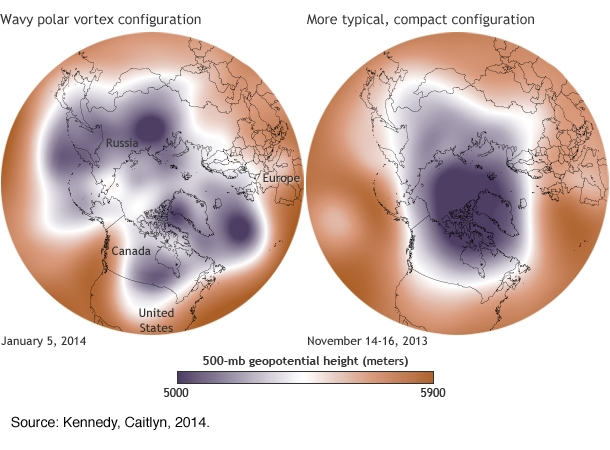 In 2014, there was a significant weakening of the Polar Vortex. The low pressure was less low, and the speed of the wind rushing counterclockwise around the North Pole slowed. The result was that the Polar Vortex was less able to prevent blasts of cold arctic air from pushing their way south. The map at right shows the weakened, wobbly Polar Vortex of January 2014, compared to a normal Polar Vortex of November 2013. The white line is the boundary of the vortex. Notice how the boundary in November 2013 was smooth and extended about as far south as the border between Canada and the USA. But in January 2014, it was full of bulges and intruded well down into the Midwest. That’s cold air, and when it was over Missouri, we had frigid temperatures. But as the cold air rotated away from Missouri flowing counterclockwise around the North Pole, the boundary of the Polar Vortex retreated northward. Warm air replaced the frigid air, and we had warm temperatures. These alternating air masses caused the wild swings in temperature. I don’t think anybody knows for sure why the Polar Vortex suddenly weakened – from November 2013 to January 2014 is only two months, after all. It doesn’t seem to happen every year. But a weakened Polar Vortex is one of the predicted effects of climate change. Kennedy, Caitlyn. 1/18/14. “Wobbly Polar Vortex Triggers Extreme Cold Air Outbreak.” ClimateWatch, National Oceanographic and Atmospheric Administration. http:// http://www.climate.gov/news-features/event-tracker/wobbly-polar-vortex-triggers-extreme-cold-air- outbreak. M. O. Jeffries, J. Richter-Menge, and J. E. Overland, Eds., 2014: Arctic Report Card 2014, http:// http://www.arctic.noaa.gov/reportcard. By mogreenstats in Climate Change, Weather Patterns on 2015/01/22 .